Continuing our caffeine-fuelled quest to show you some of our favourite coffee shops in London. There's more to well established Sacred Café, cradled in the middle of Carnaby Street, than meets the eye. While most hipsters flock to Soho darlings like Flat White and Milk Bar for their cup of Antipodean coffee, Sacred has been serving a mean cup of long black for the past five years. New Zealand owned, this atmospheric café serves coffee that is specially made for them by Darlington's and uses a mix of fair trade beans from Ethiopia, El Salvador, and Brasil. 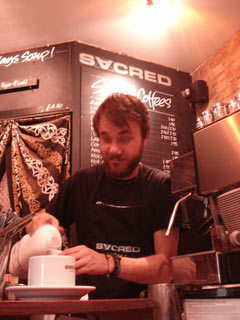 Sacred serves strong flat whites, mochas, and cappuccinos and also offers latte macchiatos, which according to barista Philip Pollen, is a popular beverage for people who prefer less caffeine.